Your carpet is releasing a foul smell? Wondering how to clean coffee stains off your carpet? Better Cleaning Company is an expert carpet cleaning Telegraph Hill SE15 company that can give you a hand at an affordable price. Our carpet cleaners are all experienced and trained to provide a top quality domestic and commercial carpet spot cleaning service around. Dial 020 3746 3201 or send us a request online today. We will give you a non-binding and free price offer at any time. Cost-efficient carpet repair from the best cleaners ! The Finest Carpet Care. Efficient All Fabrics Treatment. We offer the most efficient carpet cleaning methods for thorough cleaning of natural or synthetic carpets materials, including steam carpet cleaning and dry carpet cleaning Telegraph Hill. 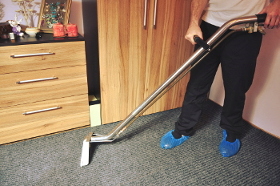 Every carpet cleaning process begins with hoovering and an inspection of the carpet. The detergents are tested and the high traffic areas and the stains pre-treated. Depending on the type of carpet, either our steam carpet cleaners will use a hot water extraction machine to rinse and wash your carpet, or our dry carpet cleaners will execute a more secure dry shampoo cleaning which uses no water. Better Cleaning Company is a trusted professional carpet cleaning company in the area. We offer outstanding carpet repair services, clear pricing policy, affordable prices, easy booking system, availability 365 days a year, and high quality professional cleaning equipment and Prochem certified detergents. Our cleaning services are covered by insurance, and our skilled carpet cleaners Telegraph Hill SE15 can get all carpet types cleaned. You can have an extra fibre protection on demand. We also offer air moving systems if you want to make the drying process faster than the average 3 hours it normally takes for a carpet to dry after steam cleaning. Take advantage of our simple to use 24/7 easy reservations system right away. Call us 020 3746 3201 or send us a request online here, and we will send you over our leading carpet cleaning experts in Telegraph Hill SE15 on any day you need them. For your comfort we offer public holiday and weekend availability. We have affordable and fixed prices. We ask for no for the reservation and you will enjoy a discount of up to 15% of service you order along with the carpet treatment. Landlords, estate agencies, regular customers and customers who book our services early on will all get special prices. Make a free and quick reservation today!